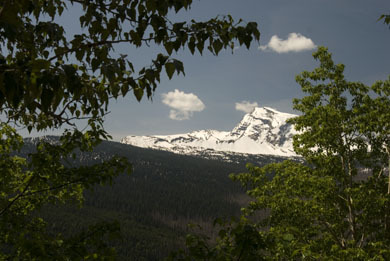 ©Bert Gildart: Each spring the opening of Glacier National Park seems to be a gradual thing. The snow is cleared, but then a late season storm blows in undoing some of the work road crews have performed in attempting to open the 52-mile-long Going-to-the-Sun Road. This year is no different, but there are some advantages to the gradual opening, particularly if you are a cyclist. Though the road is not quite suitable for vehicular traffic it is perfect for foot and bicycle traffic. 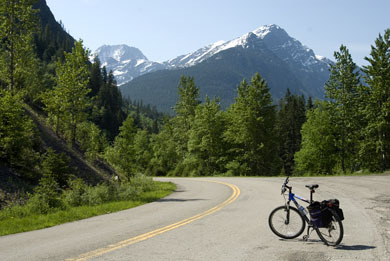 Often the portion of the road that is closed is the 15 mile section from Avalanche Creek Campground to Logan Pass, and so if you are a cyclist or a hiker you can be among the first to see this spectacular portion of Glacier. Yesterday, I set out on my mountain bike for the 15 mile uphill ride to Logan Pass, knowing that the last few miles were still closed because of road construction. The rewards were immediate. 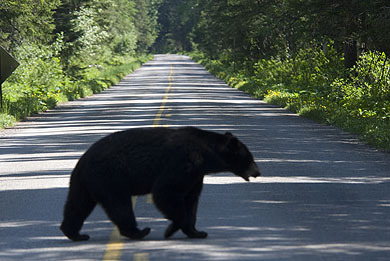 Within the first half hour, a bear crossed the road. Five minutes later two deer poked their head out from the brush flanking McDonald Creek. Several other bikers had pulled over and were searching the rushing waters for Harlequin ducks. What’s more, the day was perfect with sun shinning on snow still lingering along peaks with names like Haystack Butte, Mount Oberlain, and Iceberg Peak. Continuing my ride I began ascending in earnest the portion of the road where switchbacks become frequent. The grind was challenging, but I had been riding my bike almost every day for the past month, and the conditioning was paying off. Soon I passed Packer’s Roost, a camp used by horse packers taking food and equipment to one of the park’s chalets still in operation. Then a few minutes later, I came to the west-side tunnel which so perfectly frames Heaven’s Peak. The setting brought a flood of memories from all the years I worked in the park. Shortly after graduating from high school I moved to Glacier National Park and one of the first things I was called upon to do as a seasonal trail crew employee was to fight fires along the slopes of Heaven’s Peak. Next year, several other fellows and I climbed to the mountain’s summit. David Wilson was one of the young men and the following week he ascended Sun Mountain—then disappeared. We know he made the mountain’s summit as he signed the register on top of the peak, but after that he vanished and speculation continues to this day. Perhaps he fell; perhaps a bear got him. Or maybe as Bob Frauson, district ranger at the time and our search leader speculated, he staged his disappearance and may one day turn up in South America. All that can be said with any certainty is that we searched for David Wilson for over a week, and never found a trace. When I finally reached the furthest point to which I could cycle I stopped for lunch and was soon joined by several other cyclists. One couple (Nancy and Scott) were the first I’d met in a very long time who had actually lived in the valley for any length of time and who knew some of the same people I had known. In the past 15 years, the population of the valley has more than doubled, meaning that I don’t recognize many people any more. Though the trip up required about 2 ½ hours, the trip down was accomplished in about 45 minutes—minus photographic stops. Because winter damage to the road this year was worse than normal, park officials say it will be late June or early July before the road passing over Logan Pass will be completely open. The drive is, of course, spectacular, one that Charles Kuralt called one of the nation’s most spectacular. It’s a drive I, too, enjoy, but since the road is not open, that means for a few more weeks, cyclist pretty much have this most inspiring portion of Glacier all to themselves, and that’s something I don’t mind at all. 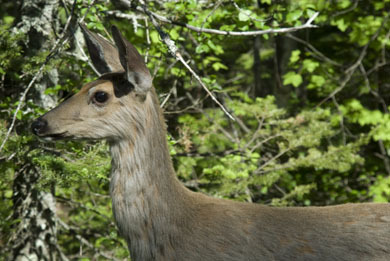 This entry was posted on Tuesday, June 5th, 2007 at 6:11 am and is filed under Glacier National Park, National Lands, Travel. You can follow any responses to this entry through the RSS 2.0 feed. You can leave a response, or trackback from your own site. Bert, your photos always amaze me! Some day I’ll need to spend a few weeks with you to learn how to take a truly amazing photo. I’ll trade ya with too much computer knowledge! Hope all is well with you guys. If you’re heading to AZ, make sure to let me know!!! I am looking onto biking across and around Glacier NP but wanted to back country hike and stay a night. Where would be a safe place to leave my bike and panniers? Fantastic site you have, thanks! Hey, great site! Do you know if there is a annual event when they close the road to cars for the day and just have a cyclist event? That would be awesome. I was there before via car and feel in love, but have wanted to ride the route on bike ever since I left…but I would not attempt such a ride as narrow as that with cars around me.